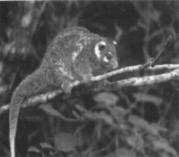 Seven species of leaf-eating (folivorous) marsupials are endemic to the Wet Tropics rainforests of north-east Queensland, including four species of ringtail possum (Hemibelideus lemuroides, Pseudocheirops archeri, Pseudocheirulus cinereus and P. herbertensis), a brush-tail possum (Trichosurus vulpecula johstoni), and two species of tree-kangaroo (Dendrolagus bennettianus and D. lumholtzi). These species comprise nearly half the folivorous marsupial fauna of Australia, and are regarded as 'relicts' of the rainforests that covered much of continent millions of years ago. Close relatives of most of the Wet Tropics species are also found in the montane rainforests of New Guinea. The ecological factors which determine the patterns of distribution and abundance of these species are poorly understood. Why, for example, are almost all the leaf eating marsupials in the Wet Tropics restricted to higher elevation forests? Understanding the factors controlling distribution is crucial for any rational management of the species. The results may also be applicable to the related, but poorly understood New Guinea marsupials which face pressing threats to their conservation. John Kanowski has been investigating the distribution of leaf-eating marsupials in his PhD study. Initially he conducted surveys in the Atherton region, which has the largest block of continuous rainforest in north-east Queensland. A survey of the abundance of the folivores at 40 sites found that all folivore species were most abundant in high elevation forests above 700 m. John then set about to investigate various ecological factors which may explain why these marsupials are found only on these mountain tops. Are the marsupials restricted to high elevation forests because of predation? John thought that one of the factors causing this distribution could be pressure from predation. The rufous owl, a specialist predator of arboreal vertebrates, was generally thought to be common only in lowland forests in the region, and predation by the owl could be responsible for restricting the possums to higherelevation forests. However, surveys conducted in his study found that the rufous owl was relatively common in high elevation forests of the study area. These results are sufficient to refute the notion that predation by the owl restricts possums to higher elevation forests in north-east Queensland. Foliage is a poor quality food, low in protein and often rich in toxins, and folivorous mammals are very sensitive to foliage 'quality'. John expected that leaf chemistry would explain the distribution of folivorous marsupials in rainforest, as it does for possums inhabiting eucalypt forests in Australia, and leaf-eating monkeys in rainforests elsewhere in the tropics. A comprehensive survey of leaf chemistry conducted in his study found that there was little difference in the concentration of nutrients between high elevation and low elevation sites. He has found, however, that concentrations of certain nutrients are higher in the leaves of forests growing on basalt soils compared with those on granitic or metamorphic soils. Also, on the poor-soil sites leaves are tougher, and tend to have higher concentrations of phenolics which are toxic to marsupials. Four of the five folivore species were more abundant in forests on nutrient-rich basalts, than forests on poorer granitic or metamorphic soils. So although leaf chemistry may explain why there are more folivorous marsupials on basalt forest sites, it does not explain why these marsupials are restricted to such high elevations. Detailed studies of the diet of the folivores at two sites in the study area have shown that each folivore obtains most of its diet from a few related plant species, and that these 'keystone' plants are different for each of the folivores. If the folivores prefer eating particular keystone plants, perhaps, John thought, the distribution of these plants determines the distribution of the folivores, in much the same way that the Koala Phascolarctos cinereus is found only in eucalypt forests, regardless of the apparent suitability of other forest types? To test this notion, Tony Irvine of CSIRO, Atherton, conducted a comprehensive botanical survey of 16 sites in the study area. The results indicated that the distribution of the plants was not closely related to the distribution of folivores. While a number of plant species important in the folivores' diets are more common in highland than upland forests, most food plants have a wider altitudinal distribution than the folivores. These results strongly suggest that the folivores are not restricted to higher elevation forests because keystone plants are absent from upland and lowland forests. Three of the possums endemic to the study area live in hollow trees, although two also den in large epiphytic ferns. Hollows (and ferns) presumably provide shelter from predators and from extreme climatic conditions, and may constitute an essential resource for these species. Dens occur most frequently in large trees which are more common in forests on basalts than forests on granitic or metamorphic soils, but there is no significant difference in the occurrence of large trees between upland and highland sites. Then why are the leaf-eating marsupials restricted to high elevation forests? folivores are restricted to high elevations because they are intolerant of the high temperatures experienced in the lowlands. Additionally, a major source of water used by the folivores to keep cool condensation from dew and mist-is not available in the lowlands. This combination of increasing water demand but decreasing water availability may restrict abundant populations of the folivores to forests above about 800 rn, where the cloud band typically forms. Testing this theory will require investigation of the thermal physiology of the folivores. Does this restricted distribution make these animals vulnerable? Climate change poses a threat for the leaf-eating marsupials for two reasons. 'Global Warming' is predicted to increase atmospheric temperature by 1ºC to 30ºC by the end of the next century For every 1ºC increase in temperature, the cool climate zone in the Wet Tropics is likely to be 'pushed' 200 m higher up the mountains. If the folivores are restricted to higher elevation forests because they are intolerant of high temperatures, then the projected increase in temperature due to global warming will greatly reduce the area of habitat suitable for these animals. In the forests of the Atherton tablelands region, that would mean a 67% reduction in the area of suitable habitat. If average temperatures rose by much more than 2ºC then the marsupials may be forced from all but a handful of the highest peaks. The increasing concentration of carbon dioxide (C02) in the atmosphere (also associated with Global Warming) is likely to change the chemistry of rainforest plants, making the leaves less nutritious for the marsupials to eat. Plants grown at high C02 concentrations are less nutritious, and contain greater amounts of natural plant toxins such as tannins. than plants grown at current C02 levels. An episode of natural climate change of similar magnitude, several thousand years ago, is thought to have eliminated the marsupials from many parts of the region. Researchers from the Rainforest CRC, in collaboration with colleagues from JCU Cairns, are planning to directly test the idea that the distribution of the marsupials is due to their intolerance of high temperatures. This research is planned for 1999/ 2000. Mr John Kanowski is a Rainforest CRC postgraduate student enrolled with James Cook University He works from the CSIRO laboratories at Atherton. The CRC for Tropical Rainforest Ecology and Management is a formal partnership between the CSIRO, James Cook University of North Queensland, The University of Queensland, Griffith University and the Wet Tropics Management Authority. Providing science for the conservation and management of Australia's World Heritage tropical rainforests.